Epiphytes covering a branch 150 feet up. This is a very light covering compared to some trees with larger branches. Some trees have epiphyte mats which are several feet deep! For us ground-dwellers, the canopy is a lot like the ocean: you can see the edge of it, but you can’t know anything about it until you don gear that will allow you to step into that other layer of life. For the canopy, this means getting in a harness and climbing a rope perhaps 150ft above the forest floor. In the field, scientists climb a single rope that goes over a branch and is anchored at the bottom. 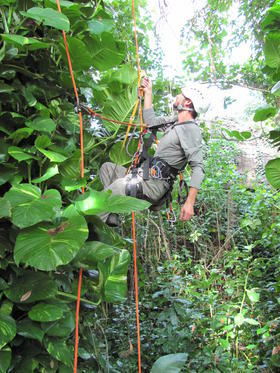 In B2's tropical rainforest, researchers climb ropes hung from the space frame to access the tree tops. The environment up in a rainforest's canopy is entirely different from that of the forest floor. Here you'll find epiphytes, "air plants," which creep up the tree trunks or cling to the branches. Epiphytes must be able to live with high exposure to sun, much drier air, and—the most striking difference from the forest floor—no dirt! For this reason, the plants living in the canopy are specialist species. Many would not survive on the forest floor, nor could plants from the ground survive in the canopy. Epiphytes can make up a third of the species of plants in a tropical rainforest, so they're important to consider in conservation planning. Many insects, birds, and mammals use epiphytes for food and housing, and even reproductive sites. 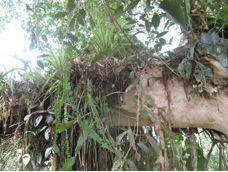 Due to the activity of animals, the epiphyte mats are full of seeds from distant trees and other plants. When a tree with a lot of epiphytes is left in a pasture, or as a shade-tree in a coffee plantation, the seeds in the epiphyte mats on its branches can serve to naturally replant the forest when the pasture or plantation is abandoned. The seeds are planted when animals, wind, and rain erode the epiphyte mats, dropping the seeds they contain to the ground. Sometimes whole branches fall, and eventually the entire tree falls. The sprouting seedlings receive shade from the tree and nutrients from the epiphyte mats that fell around them, which help them get a healthy start. In Biosphere 2, we can establish epiphyte colonies, and then expose them to various temperatures and water stresses. Observing their responses, we learn how this important component of the ecosystem will respond to climate change. An important consideration in conservation is how epiphytes respond to being at the edge of an isolated forest, such as a patch of forest surrounded by agricultural land. In B2 we could simulate the ‘edge effects’ such as higher wind and longer sun exposure. By observing responses we could get an idea of how far away epiphytes need to be from an edge in order to thrive and continue to do the helpful jobs they do for animals and for the trees they live in. Also, by hanging ropes from the space frame, we can access any point in the three-dimensional environment. These factors make Biosphere 2 an ideal place to study this difficult-to-access layer of the ecosystem.